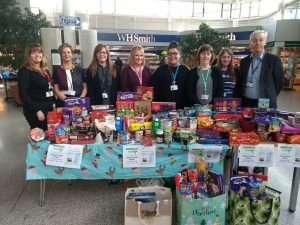 Kind-hearted staff throughout Cardiff and Vale University Health Board (UHB) recently contributed to a festive foodbank collection to help those in need this Christmastime. 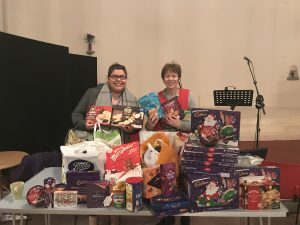 The festive foodbank was organised by the Patient Experience Team across University Hospital of Wales (UHW) and University Hospital Llandough (UHL). Foodbanks help by providing emergency food and support to people experiencing crisis. Amazingly over 40 bags of groceries were donated to be shared between two foodbanks across the region. Donations collected in UHL were donated to the Vale Foodbank and donations collected at UHW went to Cardiff Foodbank. Jane Rowlands-Mellor, Lead Nurse Patient Experience at Cardiff and Vale UHB said, “We were really pleased with the donations received from patients, visitors and staff.